Public memory is said to be phenomenally short. But politicians’ memory is conveniently so. Many great persons in the country are forgotten only because it suits the political bosses to ignore or underplay them. While the centenaries of lesser men and women are celebrated, a journalist who laid down his life for unifying the country at a very young age is being ignored. October 27, 2020 is the centenary of a great journalist, Shoebullah Khan, who was editor of an Urdu daily Imroze in the Hyderabad State of the Nizam at the age of 20. He courageously opposed the plans of the Nizam and the Razakar party of Owaisi (now MIM party) to make his state (now Telangana, parts of Marathwada and Hyderabad Karnataka) join Pakistan or be an independent state. For this, the Razakar killed him brutally on August 22m 1948 and cut his hands as ordered by Owaisi. This was one of the triggers that prompted Sardar Patel’s “Police action” that liberated Hydeabad. 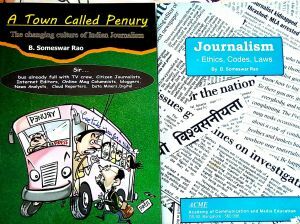 My book ‘A TOWN CALLED PENURY – the Changing Culture of Indian Journalism‘ mentions how Congress, just to placate Owaisi and his party (which was used by the Congress for it’s communal politics), ignored Shoeb. However tributes were paid to him by Bharatiya Janata Party’s elder leader L K Advani in 2003. A gate of Narendra Modi’s election rally at Nizam College grounds in Hyderabad in 2014 (remembered for being the first such rally with an entrance ticket) was also named after Shoebullah Khan. I appeal to all journalists and nationalists to observe the centenary of Shoeb for which a Shoebullah Khan Centenary Committee may be formed now to plan a national programme for promoting excellence in the profession, instill social responsibility and improve and regulate journalism education in India which in bad shape. Thus it would be an occasion for concrete and significant action instead of more speech-making. The initiative may come from Osmania University Journalism Department which offers an annual prize in Sheob’s name for the top ranker in its examination. I mailed this appeal to hundreds of journalists. ONLY ONE responded. Fake news may turn out to be a major problem of the first quarter of this century. The profession ha not been able to think out a way to counter this problem. An initiative in that direction can be taken during that certification. The media, especially the print media to which Shoeb (and I) belonged is going through a crisis of existence. It may be taking its last breath and an initiative to save or reform it can be taken during the celebration. The electronic media is badly entangled in TRP rat race resulting in sensationalism and lack of social responsibility. The role of some TV channels in helping the Kasab-led terrorists in the 26/11 Mumbai attack is a case in point as also the frivolty dominating all media at the cost of significant news. As I had pointed out journalism, supposed to inform, educate and entertain has reversed the order of it’s objectives, sometimes resorting to titillation instead of entertainment. There are scores of them but most of these departments are headed by people without any experience in the media, teach outdated syllabi and are ill equipped. Most dole out personnel for advertisement or public relations setups — and that too not well equipped. If some of their students do become good journalists, it is NOT because of them but IN SPITE of them. An ‘All India Council of Technical Education (AICTE) regulates engineering education in the country (clubbing with it, for no reason, management studies or MBA). Why not have a similar body for journalsm education?